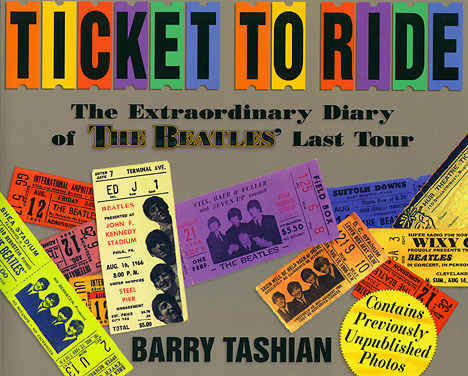 Considered the king of all Beatles tour passes, this is the highest ranking pass in Beatles collectibles existence, as the Beatles themselves did not carry any. Apparently found in a desk that was sold from Epstein's estate, the pass is contained in a hard plastic holder that exactly fits the dimensions of the pass itself. Tour passes were issued in different colors for different levels of security. A red pass denoted someone who was in the Beatles' inner circle (i.e. Brian Epstein, Tony Barrow, Mal Evans, Neil Aspinal, etc.). These red passes were issued and controlled by Brian and Tony. 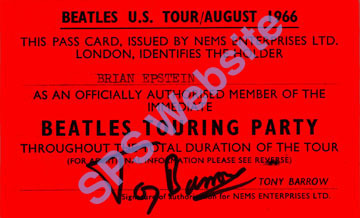 Tony's signature appears on the red passes, as shown above. The passes were intended to be carried for the duration of the tour. 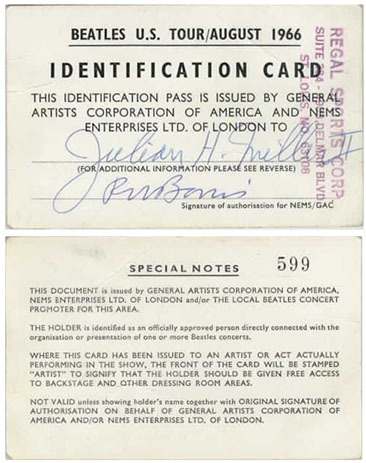 White passes were issued by GAC (General Artists Corp.) under the auspices of Nat Weiss, and were given to other tour members (artists like the Remains), roadies, concert promoters, and invited guests of promoters. 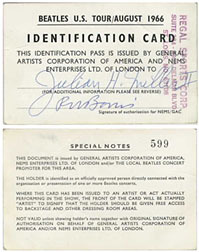 The Beatles were the pioneers of this practice of using passes. They were a necessity because of the mania, the lack of control, and the fact that even people like Brian Epstein were given a hard time getting close to the Beatles. Each pass was sequentially numbered for control purposes, and the text on the back of the red pass is different than on the white. White Artist pass belonging to Barry Tashian of The Remains, who toured with The Beatles in 1966. 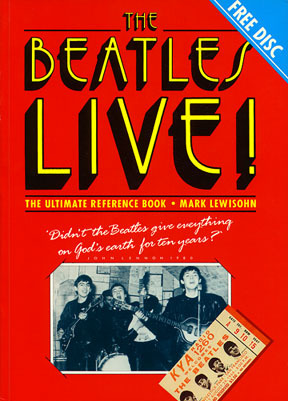 This incredible 200-page Lewisohn classic published in the UK in 1986 is long out-of-print and very difficult to find. If you run across a copy, don't pass it up. 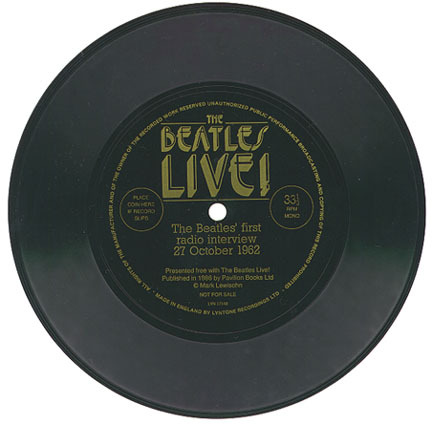 Included in a pocket in the back of the book is a flexi-disc with the first ever Beatles radio broadcast in 1962! Currently selling for $25-50.00 (when found), this book and disc set will surely climb in value and become even more difficult to find in the years ahead.